Part one took us from Torrance to Manhattan Beach on the L.A. Beach Bike Path, and part two began in Manhattan Beach and ended as we arrived at Venice Beach. This article is part three so if you are starting here, you may want to navigate to parts one and two first. Part Three: Venice to Temescal Canyon. We begin this ride at the end of Washington Boulevard, which we old-timers call Washington Street, because the Boulevard used to veer North following the historical alignment of the streetcar lines, but it was renamed Abott Kinney at that point. so what was formerly Washington Street took on the name of the Boulevard. So we are at the Southern end of the Venice Beach Boardwalk. Visitors from the East coast will notice that this is boardwalk by name only. The surface is asphalt, or in places concrete. The L.A. Beach Bike Path is, as it was in the South Bay, still concrete. Looking out to sea from our starting point is the Washington Street Pier. If you are not in a hurry to scoot off down the bike path on your, KickPed, Xootr or other kick scooter, this pier is worth a stroll to the end and back. Being roughly in the middle of Santa Monica Bay you will see the Palos Verdes Peninsula to the South and Malibu and the Santa Monica Mountains to the South. Anyway, we have scooted down the bike lane and can now rejoin the real bike path here at the beach and head South again. Between Washington and Venice Boulevard the main attraction is the architecture of the homes that face Venice Beach here. The bike path here is never straight so there will be curves to keep us interested. And on this side of the Marina our bike path is much busier at all times. Just before Venice Boulevard there is the big lifeguard station on the left that the fans of Baywatch will remember as the Hoff’s HQ. For the next third of a mile, the bike path is one or two hundred feet from the main action of the boardwalk. If you have visited Venice before and are concentrating on our twenty six mile scooting chautauqua then this distance will be welcome. But let’s not forget that Venice Beach is second in attendance only to Disneyland in SoCal. And usually you can scoot through the crowds without ever getting so much as a dirty look from law enforcement. So one day, perhaps after you have covered every yard of the path, please bring your scooter back and ride the boardwalk as well. Sandwiched between the bike path and the boardwalk you will see the paddleboard courts, the volleyball courts, the basketball courts and the famous Muscle Beach, which moved here from Santa Monica decades ago. At mile 16 is Venice Beach Park which has been much improved in recent years and is usually full of dancing quad-skaters and other assorted Venice Beach performer-types. This park too is nice place to scoot back and forth and around and around, going nowhere in particular, unless you are on this mission to complete the path. To the left, or beach side of the path is the Venice Skate Park. Kick scooters are designed to go forward nicely, but you will see some people here using them as jumping vehicles and generally making a lot of noise and falling down a lot. If that is your thing, good luck. For the next mile, Venice Beach gives us the nicest curves on the bike path. Lovely swooping lefts and rights. There is however a lot of sand on the concrete here that can result in a skid. On a KickPed you will be stable, but your pushing foot may have to be aimed at sand-free patches in some parts. Mile 17 is the end of Venice and we enter the City of Santa Monica, our tenth city since the beginning. This section is on Ocean Park and it is even better than Venice for a nice day out on your scooter. In fact if all you want to do is ride, then Ocean Park is the best place on the L.A. Beach Bike Path to bring your push scooter. In decades past there was large pier and amusement park here, and the sand is four hundred feet from path to surf. What remains is a vast parking world. Even on the busiest days, these parking lots never get full, so there is always plenty of asphalt for us to enjoy kick scooter fun in the sun with an ocean breeze. At Perry’s Cafe Bike and Skate you can enjoy some good food by beach standards and watch the world ride by as you enjoy a break. There are eight Perry’s on the bike path, but Ocean Park is the place. At Bicknell, just before mile 18 we leave Ocean Park and we remain in the City of Santa Monica. Here we find many people walking on the bike path, and despite the slower speeds of our leg scooters we still have to be alert and not let these violators step right in front of us without warning. We see the large hotels to our right as we get nearer and nearer to Santa Monica Pier. This is where Muscle Beach originally was, in the grand Hollywood era, before it was reintroduced in Venice as World Famous Muscle Beach. And then for two hundred feet, we are under the pier itself, kick scooting in the shade with the smell of preserved wood, and salty air mixing together to form that beachy smell of the nineteenth century. Of course it goes without saying that this pier is a good place to visit, but let’s keep going. After the pier parking lot, the path bends toward shore and keeps going and going. The sand here is a good seven hundred feet wide from bike path to surf. We hear traffic now, as the Interstate 10 has ended it’s cross-continental span and emptied into Pacific Coast Highway just a short distance off to our right. But we pass houses and parking lots as the bike path straightens out and shadows the road. Mile 19 is Santa Monica State Beach Park, and when we see lifeguard tower 18, we are at Santa Monica Canyon. Inland this channel cuts through the land to form a chasm between Santa Monica and Pacific Palisades, but more interestingly, under the ocean where we cannot see it, it forms a deep underwater river valley that cuts down through Santa Monica Bay. For us, it is mile 20, and we leave Santa Monica. The Pacific Palisades area of Los Angeles is our eleventh city. At Mile 21 we pass Palisades Park and we commence the final five mile scoot of our journey. At Temescal Canyon, it is the end of the road. A parking lot in the 14800 block of PCH. This is the Northern end of the L.A. Beach Bike Path. I doubt that anyone would ride a human-powered scooter all the way from Washington to Temescal in one day. It is over ten miles and then you need to get back, but there are some cyclists who do the whole thing in one session. We can choose to take this a section at a time depending on our strength and endurance. And of course you don’t have to start in Torrance, you can ride from North to South and end there instead. Always remember, as I said in parts one and two, whenever you take a long scoot in one direction, you need to have enough energy to get back again. Of course if you do over-extend yourself, you can always take a taxi back! Compared to the cyclists for whom this epic path was built, we kick scooter riders have a different ethic. We like to stand upright and see what is around us, and take our time, and stop frequently and have conversations. Considering the beauty of this little coastal concrete ribbon on the West coast, I think that kick-scooter riders can get a deeper appreciation of their surroundings, despite having to input more energy to complete the journey. 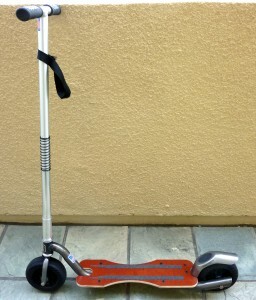 NextNext post: Scoot Like a Pro!